Thanks for the super comments and votes. Yup. You have a knack! Congrats on the blue, Anita. 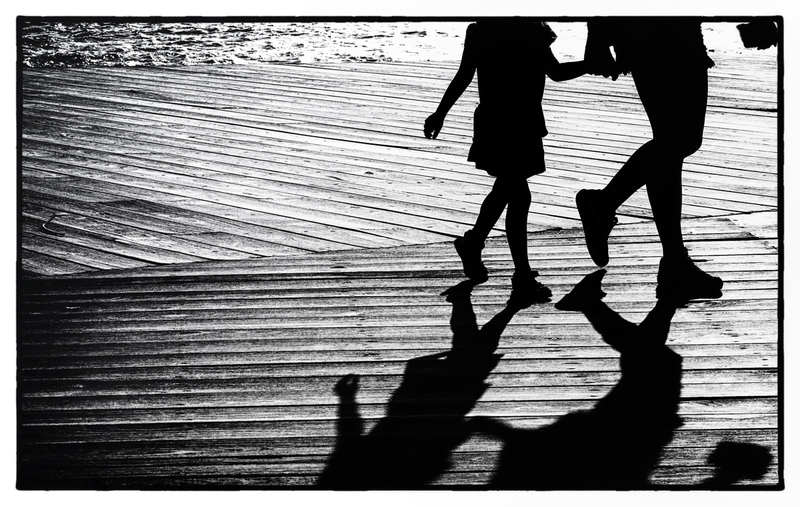 I love the strong silhouettes and shadows and the patterns of the boardwalk as background. I love the way that those boards affect the shadow shapes. Congrats Anita, you have a way with shadows and silhouettes. oh WOW .. !!!! .. just popped in to dpc and saw this magic photo on the front page ..
this had the neat touch .. but I wasn't totally sure it was yours during voting ..
Like vaudevillians hoofing with their shadows offstage. So much enjoyable rhythm and movement here, the couple and the planking and the water. Lovely tones and contrasts. Excellent black and white. Great use of bw. My pick for yellow. This is stunning, the B&W works really good here. I like the texture of the wooden floor, the silhouettes and the shadows (which also lost their heads). My pick for the blue. In this image the cropped off heads really work. Your BW conversion is excellent. Proudly hosted by Sargasso Networks. Current Server Time: 04/20/2019 02:32:02 PM EDT.